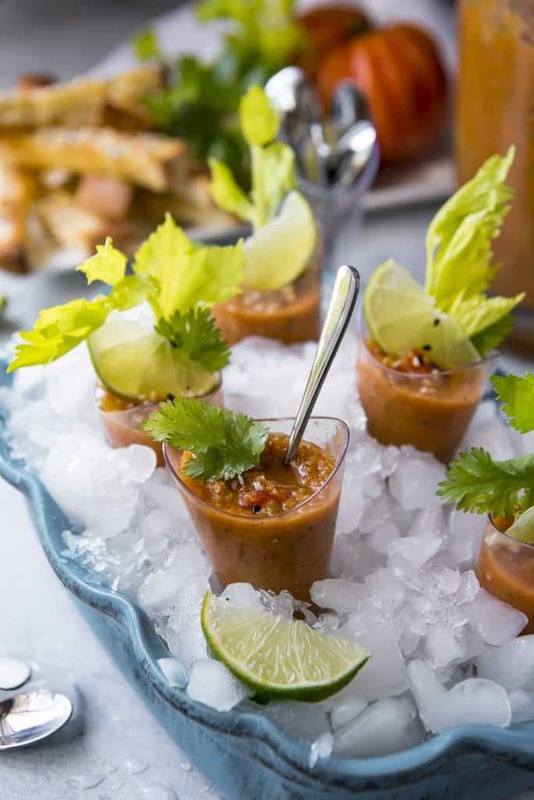 These adorable little Brunch Gazpacho Shooters are a fabulous way to celebrate the bounty that is summer produce! 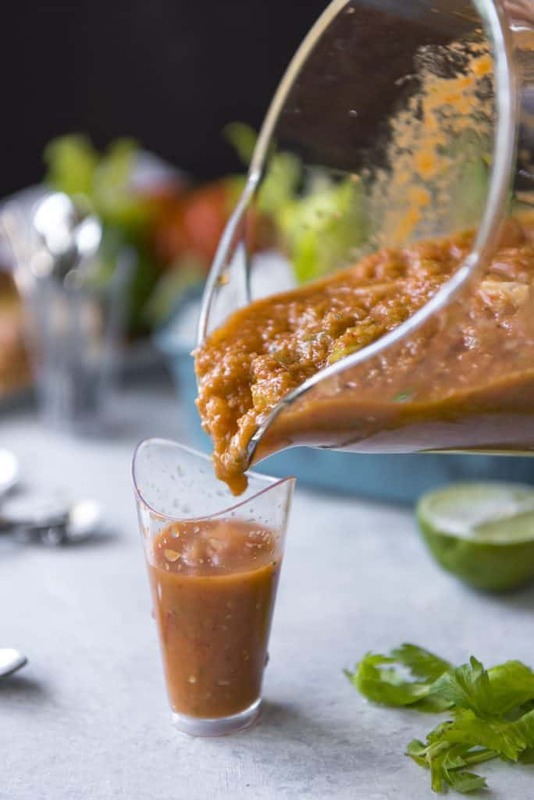 The cool and refreshing gazpacho recipe combines heirloom tomatoes, tomatillos, and roasted red peppers with a delicious blend of Spanish flavors that are perfect for a brunchtime palate cleanser. So here’s a weird yet fun fact about me: I hate bloody mary’s, but I love a good gazpacho. Like most people, I devour bowls of tomato soup with grilled cheese sandwiches in the cooler months. I can’t resist the comforting warmth that a good hearty bisque fills me with. Then again, we do live in an anomalistic climate down here, so. There’s that. 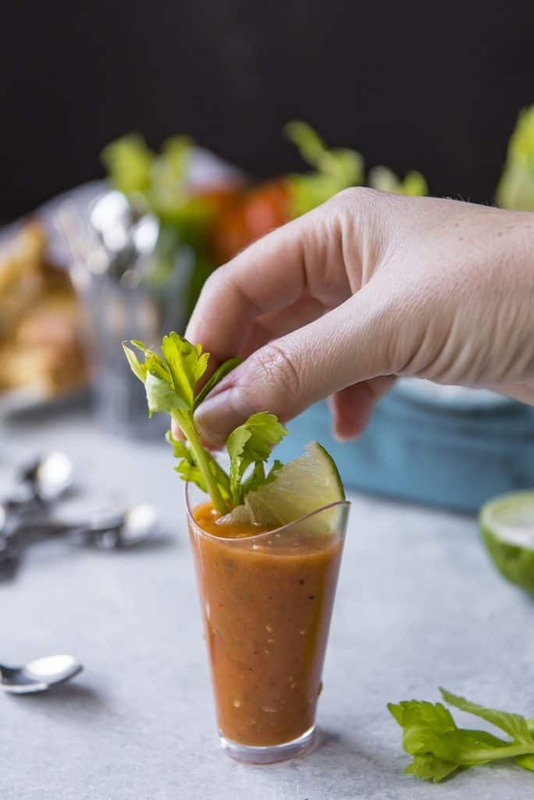 Gazpacho on the other hand – now that’s something that’s absolutely meant for spring and summer. It offers the goodness of delicious tomato soup – but cold in a completely pleasant way. Though this is not really a terribly traditional Spanish gazpacho recipe. 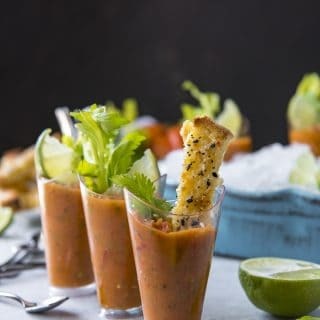 The ingredients in here are pretty much the same, but most Andalusian gazpacho recipes found in Europe are blended with stale bread to help smooth out the consistency of the final product. And they’re often much smoother than this. Funny enough, if you don’t finish all of this AS gazpacho, you could always break out the tortilla chips and call it salsa. Or just keep cranking out those cheesy everything toast strips and dip to your heart’s content! Widely eaten in Spain and Portugal, gazpacho is essentially a cold soup made of raw vegetables. Vegan, Paleo, and Whole30 compliant, you can also enjoy this healthy, antioxidant-rich gazpacho without heating up your house to cook it. 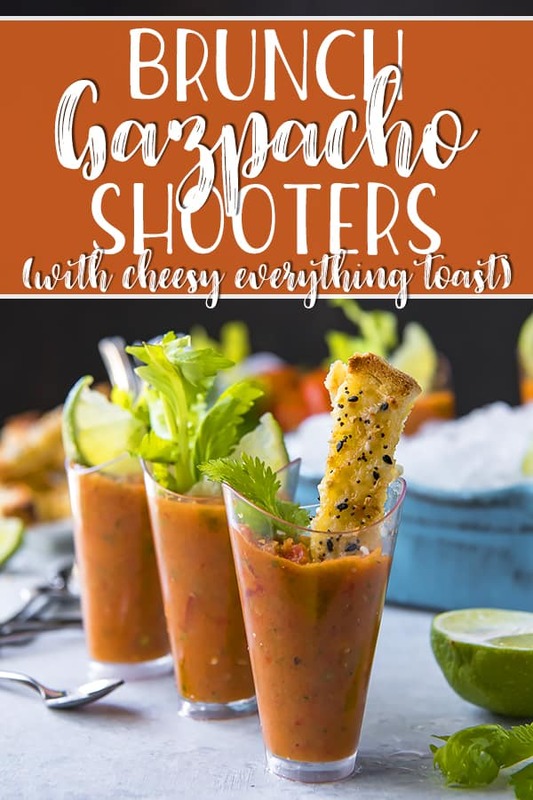 These cute, convenient little gazpacho shooters are perfect for brunch! The soup itself is light and fresh and full of amazing textures and flavors. 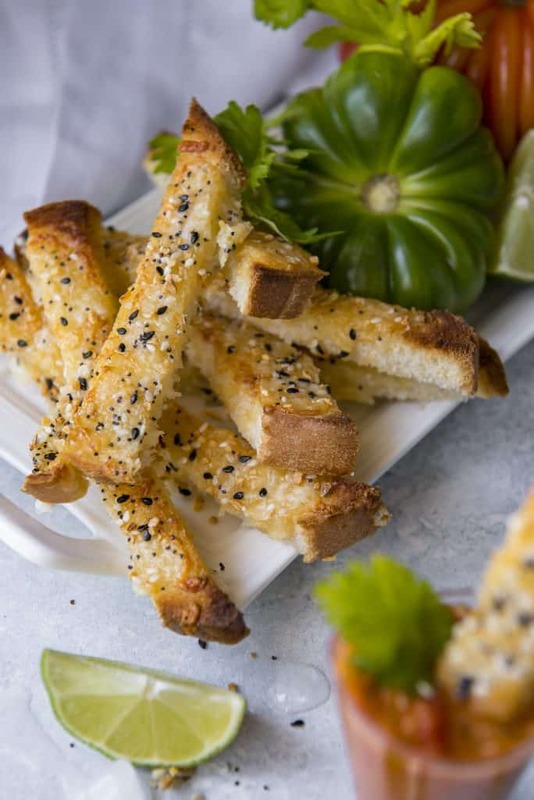 And the cheesy, salty toast dippers…you might end up eating more of those by themselves than you intend to. In between bites of rich egg-and-cheese casseroles and sweet waffles and French toast, this appetizer makes for a perfect palate cleanser! And did I mention how cute they are in these little shot glasses? Because come on. THE SPOONS, EVEN. Line these up at your next brunch event and see how fast they disappear! 1. Reserve 1/3 of the chopped tomato, tomatillo, cucumber, and cubanelle pepper in a small bowl; set aside. 2. 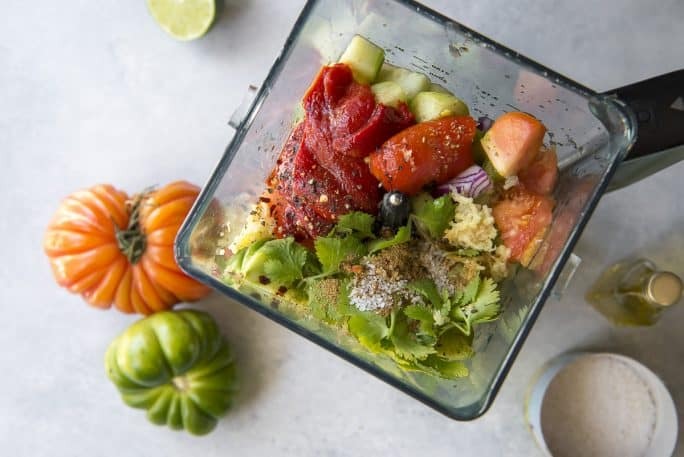 Combine the remaining chopped vegetables, garlic, lime juice, cilantro, vinegar, cumin, red pepper, and oregano in a blender. Purée until smooth, adjusting the seasoning to taste with more lime juice, salt, and pepper. 4. Cover and chill for at least 4 hours, but preferably overnight. 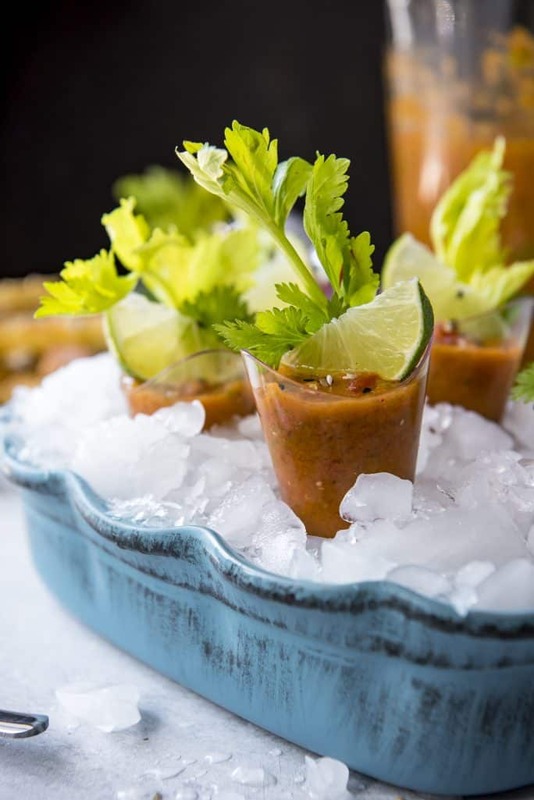 When ready to serve, ladle into shot glasses and garnish with slices of lime and small celery stalks. Serve toast dippers on the side. Looking for more great brunch appetizers? No problem! Don’t forget to enter our enormous #BrunchWeek giveaway – You could win one of SEVEN prize packs, including fun foodie stuff from Cabot Cheese, Cal-Organic Farms, and Cento Fine Foods! Reserve 1/3 of the chopped tomato, tomatillo, cucumber, and cubanelle pepper in a small bowl; set aside. Combine the remaining vegetables, garlic, lime juice, cilantro, vinegar, cumin, red pepper, and oregano in a blender. Purée until smooth, adjusting the seasoning to taste with more lime juice, salt, and pepper. Cover and chill for at least 4 hours, but preferably overnight. 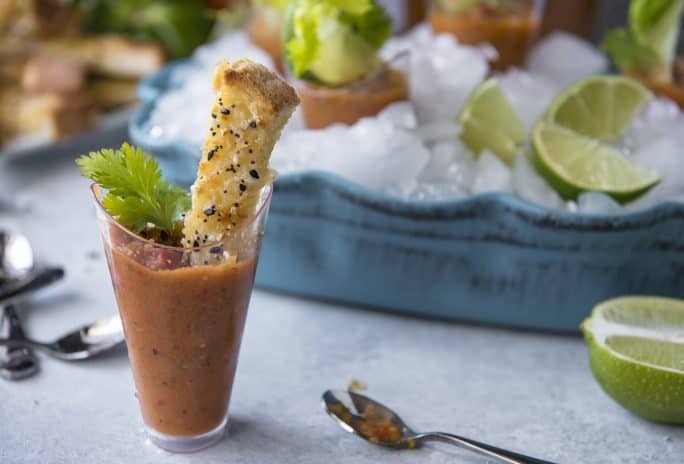 When ready to serve, ladle into shot glasses and garnish with slices of lime and small celery stalks, with toast dippers on the side. Preheat the oven to 350 degrees F. Spread 1/2 tablespoon of butter on each slice of bread. Cut each piece diagonally into 4-5 separate strips of bread. Arrange the strips side by side on a foil-lined baking sheet. Toast the bread in the oven until it just begins to brown and become crispy, 4-5 minutes. Remove from the oven and turn the broiler on high. Sprinkle each strip with shredded cheese, then return the baking sheet to the oven. Broil until the cheese melts and starts to brown, another 4-5 minutes. Remove from oven and sprinkle Everything bagel seasoning on the hot cheese so it sticks. Separate the strips when they're cool enough to touch. 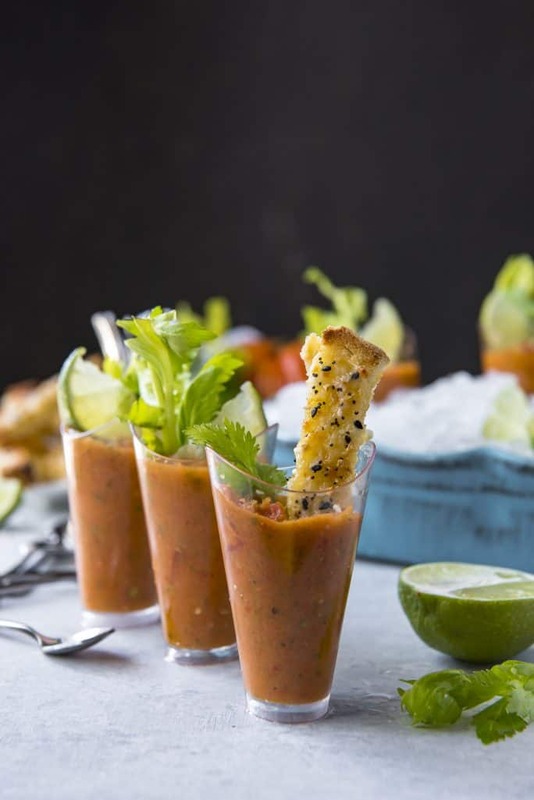 PIN THIS EASY GAZPACHO RECIPE FOR LATER! I’m not a gazpacho fan but I think these are an adorable start to a lovely brunch. Such cute shooters! I would devour a few of these. These are so cute and yet so elegant at the same time. And the dippers… YUM!